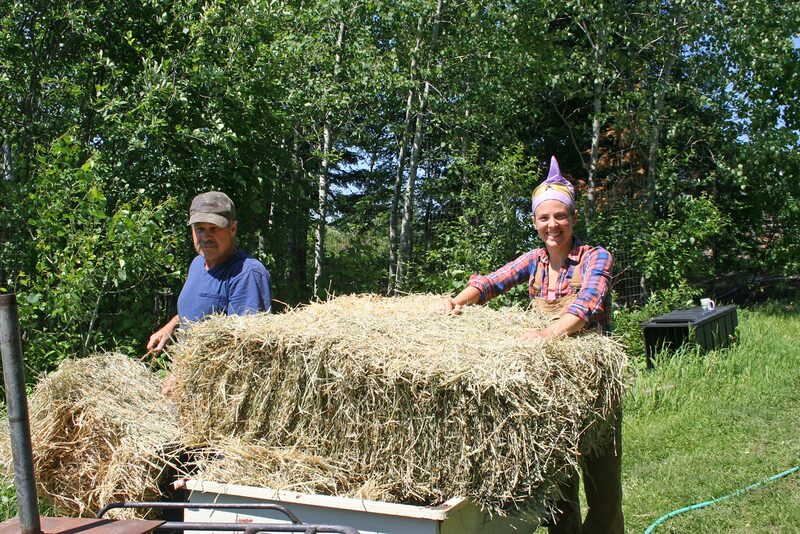 Alisha and Will carried reed canary bales from the hayloft in the barn to the garden in our little garden trailer. Then they got busy, spreading it out around and in between the tomato plants. 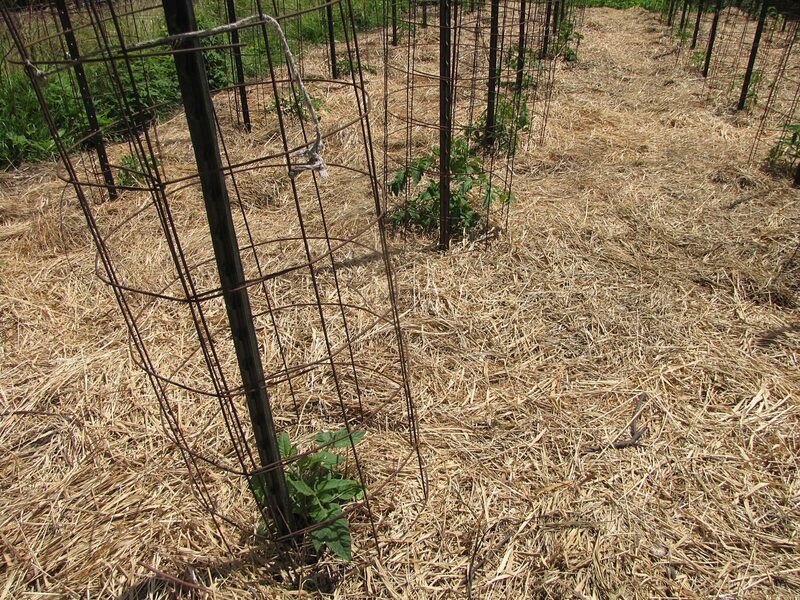 Here are the finished tomatoes, all mulched, staked, and in cages. Our corn is up and doing nicely. Of course we had to “pay off” the local ground squirrels by dumping piles of corn around the patches so they’d eat that instead of our sweet corn. They dig up and eat the seed just as the corn is up and to about three inches tall, when the seed dissolves. Strange maybe, but it works. 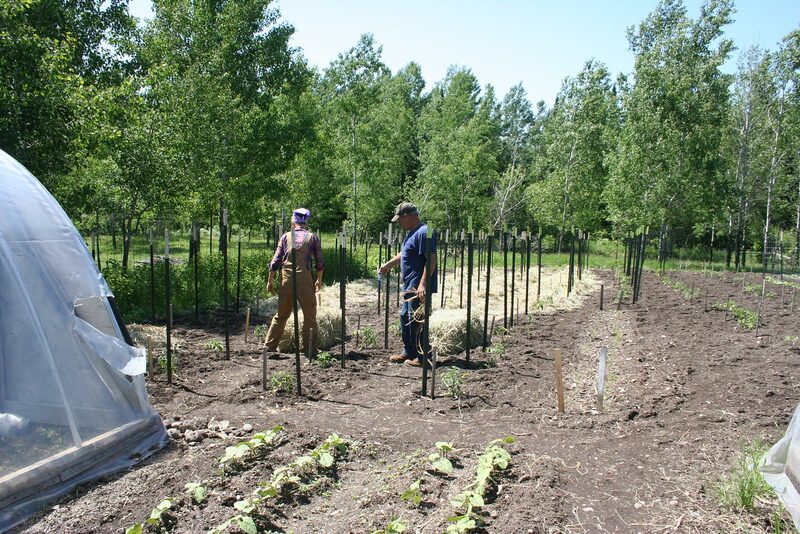 Will tilled up our central garden for the final time and I got busy and planted the whole thing. Yep, it sure got my bad knee, but it’s planted and maybe now I can rest the knee a little! David bought a load of gravel from the fellow who bulldozed our driveway free of snow when we first came here. (I’m sure he thought we were nuts!) David has a nasty mud hole between his cabin site and the camp site where they’re living during construction. He hopes to have enough left to fill the wet ruts in his driveway by the cabin too. I’m so glad to hear your garden is doing nicely. And am glad your grandchildren love the peas! Yum. I’m by no means a BIG garden person,yet. I have 2 small raised gardens this year, concentrating on tomatoes 🍅 and red potatoes 🥔 and of course, a good variety of herbs 🌿. I too have had more than my share of pesky backyard creatures even with my little space. This past week, my husband and I went on a mini vacation for 3 days. Upon our return, we discovered 4 of our 7 healthy looking tomato plants 🌱 had been broken down and ravaged by SOMETHING!!! I was angry 😡 and discouraged, but replaced and salvaged what I could. I don’t know what else to do. We have used the repellent from the hardware stores, ultra sonic pest control devices, and moth balls Everywhere! And now we have the Scare Crow water spraying thing on the way. If this doesn’t work????? Then there’s a fence….. It’s the ONLY thing that saves our garden from the deer. In a mixing bowl, mix flour, salt and sugar. Mix in melted butter. Add egg yolks and just enough water to make a batter which will pour from a spoon. Put rhubarb in unbaked pie shell and pour on batter evenly. If using canned rhubarb, add 1 cup of reserved juice to batter instead of a bit of water, then pour over drained rhubarb in pie shell. Bake at 375 degrees F until edges are golden brown and rhubarb is tender. While pie bakes, beat egg whites with salt until soft peaks form. Gradually add sugar and continue beating until stiff peaks hold when beater is held up from meringue. Spoon meringue on hot pie, completely sealing to edges of crust. Lift up peaks nicely with spoon. Bake in oven at 375 degrees F until meringue is golden brown on peaks and edges. I’d love to have you visit too, Robyn. Any time! Reading your blog for years and love it. I have had to give up gardening because of back problems. Its hard when you have gardened all your life – I grew up on a farm. You inspire me though. I think we are out of home canned tomatoes and I might have to can some this year if I can. We can buy them at the local farmers market. Your garden looks really nice. I admire you for all the work you put in to live a homesteading life. It’s a good thing you have a local farmer’s market handy. I hope you’re able to can up lots of yummy tomatoes! Thank you for your kind words. Hi Everett! Sounds like you’re off and running, too. Oh oh. Bunnies. Those little buggers can sometimes run through a 2″x4″ wire fence but as you know, they can’t run through chicken wire. I hope you get lots of BIG Bill Beans this year. I want photos!!! Don’t you love it when that first weeding has been done and you can lay on the mulch! So satisfying, and it looks so good and now most of the work is up to the plants (at least for a while). I’ve got one of my raised beds mulched, but need to pull a bunch of volunteer dill and mulch the other one. At least the dill crowed out any grass growing in, and it smells great when I pull it. Yes, it is wonderful to stand back and look at a well-mulched garden. We know we won’t have to weed again, other than a stray, weak weed here and there over summer. Love dill, even if it sometimes “misbehaves” a bit. I got the peas, carrots and beets in yesterday just in time for more than inch of rain over night. High today was 49. The pass to the west of us had eight inches of snow! Still have some raised beds to plant but they need a day to dry out. I use some woven and black plastic for ground cover but hay or straw mulch tends to keep the ground too cold. Your gardens look good. I hope your newly planted spots dry out soon. Yep, I know all about that snow thing; when we lived in Montana at 7,600 feet, we had planned on going to the Fourth of July fireworks….but got a blizzard! I am just amazed at all you plant and preserve. So glad you have some extra help. My garden is all in and doing fairly well, a little slow. Greatgrands were all excited today to see carrots coming up in their little plots. They are also busy eating peas right in the garden, even the baby at 18 months loves them. It is a fun time of the year. My roses are doing so well and so lots of arrangements in the house. Rest your knee if you can find a minute.